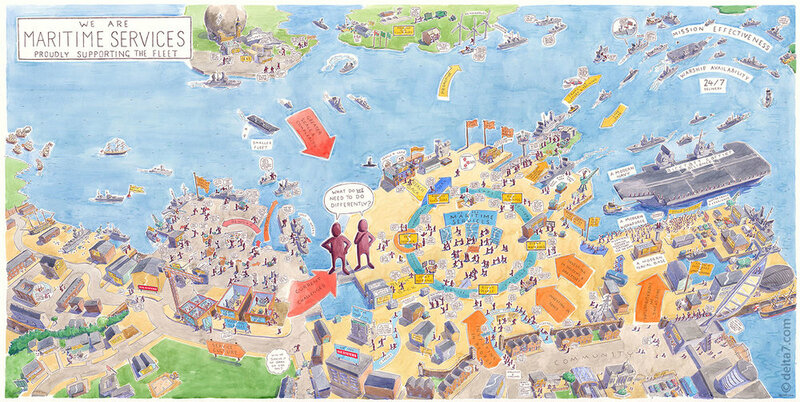 In 2012 BAE Systems brought together 3,500 people from diverse heritages to form Maritime Services. This created a once-in-a-generation opportunity to work with customers to help create a modern workforce to support a modern navy based at a modern naval base. At the helm of this major change was Martin Cooper, Finance and IT Director. A business transformation strategy was developed to invest in people, tools, systems, processes and infrastructure. This improved sustainability, optimised performance and drove down cost. The leadership team recognised that to engage and inspire staff to be up for the journey, they needed to take the strategy out of Word documents and PowerPoint slides, and bring it to life. That was the thinking behind the approach to employee engagement which led to the creation of the Maritime Services’ ‘Rich Picture’. The guts of the picture started with data collection through employee roadshows where feedback was gathered from more than 350 staff, leaders, trade unions and, importantly, customers as to what the future could look like if the strategy was realised. This input was used to develop a compelling pictorial representation of their business strategy and the challenges ahead. By working with Delta7 and following their process, the Rich Picture became a visual dialogue facilitation tool that encouraged engaging conversations about the business’s change journey, creating two-way dialogue at all levels in the organisation to listen to employees’ views and feedback. This established that change and strategy realisation is everyone’s responsibility, not just that of the leadership team, managers or a few business change agents. The programme, which has advanced the staff engagement journey, has enabled Maritime Services to continue to drive its strategy, make everyone realise what role they have to play in the business’ future and create a constant reference tool to keep the business aligned during change journeys, which are always difficult. As Martin explained, ‘It’s a common mistake in management committees and boards to create a strategic plan that is understood and agreed to be very clear and powerful in the eyes of those people who created it. In many cases, that is because it involved a good cerebral debate in its creation, and ultimately something challenging and aspirational has been written down which would clearly drive the company’s growth and profits, typically to the benefit of everyone around the table. ‘Unfortunately’, continued Martin, ‘that doesn’t wash with others in the organisation. They get stimulated and connected through different things in life, and a different angle is needed to get them as interested in the company strategy as the leaders are. This can be achieved through the power of a picture explaining the destination but allowing interpretation by different people. Furthermore, images stick and promote deeper conversation than a bunch of words, and it is this concept that drove us to create the Rich Picture to engage the whole of Maritime Services in the creation of a new model of operation with great success.